It must be one of the most commonly heard travel complaints: the misery of flying economy class. In countless travellers' tales, the meals are awful, they are seated next to a sumo wrestler, and it's remarkably cramped because they're 201 centimetres. First world problem: is business class really worth it? Many people moan about this experience, which possibly seems worse because, on many jumbos, economy travellers have to walk through the elite sections of the plane. Of course, this torture is deliberate, to convince you to pay for an upgrade on your next flight. As a rule, a business class ticket costs three or four times an economy-class fare, while a first-class ticket can cost 15 times as much. As someone who has flown in most classes, I can think of several reasons that business class – let's not even discuss that elusive, pricey first-class cabin – isn't worth the hype. Here are five good reasons to fly economy, if only to cheer up the great majority who don't have a choice. As Rose Byrne's character said in the movie Bridesmaids: "There's much more of a sense of community in coach [economy class]". Admittedly, she says it from the comfort of a business-class seat. Indeed, she's the kind of wealthy, pampered socialite who would never dream of flying economy. Nonetheless, she had a point. Partly because business-class seats are geared for corporate travellers (as the name suggests), and partly because the seats are more intimately spaced, you are far more likely to make friends with your fellow passengers in economy. If you want some privacy, slip on the headphones. But if you want to enjoy the (frankly underrated) social aspect of flying, economy is the way. Even for business networking, economy is the class. "In 30 years in international business, I have yet to meet anyone personally or professionally interesting in first class," Jean Hoffman, president and chief executive of Putney, told Inc. magazine last year. "However, nearly every time I fly economy on a miserable, long flight, I am seated with someone who proves to be an interesting person and from whom I can learn something. Inspiration does not come in first class or from a consultant with an MBA." 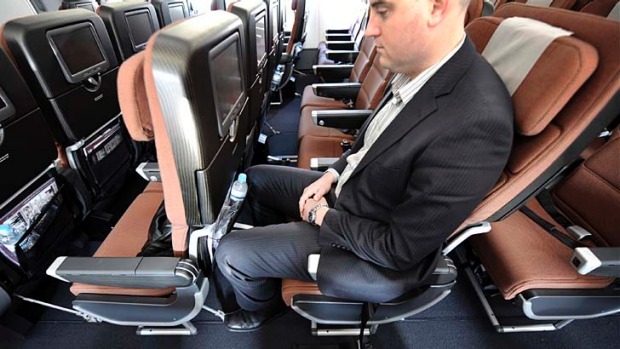 You think economy class people can occasionally get on your nerves? The truly obnoxious people are at the pointy end of the plane. First and business classes are the natural habitats of corporate types, politicians, and cosseted people who pull out their credit cards to pay a few thousand extra dollars because they can't bear going "cattle class" like everyone else. International rock stars rarely travel in economy. At the height of their fame in 1998, the English band Oasis was banned from Cathay Pacific for drunkenly abusing other passengers and making complete prats of themselves on a flight to Perth. You can safely bet they weren't in economy. If you expect a more rarefied atmosphere in business class, you might be disappointed. Based on my experience, you are more likely to be hassled by annoying children in business class. "The truly spoilt kids travel near the front of the plane," says one airline employee. "They fly everywhere on their parents' corporate accounts. Why else would a six-year-old need the extra leg room or the free champagne?" In the event of a plane crash, economy class is considerably safer. A study by Popular Mechanics magazine surveyed all crashes from 1971 to 2007 and found that survival rates in the rear seats were 69 per cent, as opposed to 49 per cent at the front. Whether this inspires you to fly economy depends on your perspective. Your odds of dying in a plane crash are only 0.089 per 100,000 flight hours, and the odds of dying in a one-hour flight are less than one in a million. Wherever you sit, you should arrive in one piece. Though it differs with each airline, business-class seats typically take up 3.5 times the floor space of economy seats, while first-class cubicles use 5.4 times the space. The exotic meals and other extras are not exactly "eco-friendly" either. This partly explains why the British Foreign Office, aiming to cut its emissions by 10 per cent in 2010, stopped business class trips for its staff. Obviously. That's the main reason we do it. But now the cost of economy class has become so cheap it could be considered a quicker alternative to driving or taking a train. Even if you enjoy one business-class trip, you will probably have to return to the cheap seats in future. This can be a trial. Once you've been in business or first class, you'll suddenly think that economy class is a living hell. Flying is suddenly re-imagined a terrible ordeal, in which you feel like a sardine and use words like "cattle class" (really overdoing the animal metaphors). In truth, it's not that bad. Unless you're 201 centimetres of course.